Ladies like me were not raised to be radical. But it’s not too late to learn. By definition, radicals are extreme while “moderation in everything” is a favorite shibboleth in our culture. The two men charged with killing worshipers in Pittsburgh and threatening to kill members of the Democratic party from all over have been called “radicals” and the media has spent hours and hours pondering when they became “radicalized.” What made them shift from talking about sports on Twitter to talking about destroying people? We often hear of “Middle Eastern terrorists” who became radicalized and therefore profoundly dangerous. We hear less about domestic terrorists who have become radicalized. The truth is that terrorists can be found of every skin color and from every land, and being radicalized is what makes them a threat. What if – in response to the onslaught of terrorism in our world – we aspired to be good radicals? What if we decided to love each other radically? What would that look like? What if we lavishly gave some of our income to ensure that a school on the other side of town was at least as good as the school where we send our own children? What if we didn’t move into a bigger, better house until we helped provide shelter for a homeless family? What if we sacrificed our vacation plans next summer to provide camp experiences for children who’ve never been to camp? Most of the world would consider such actions foolish. Most of the world does not consider strangers to be part of their human family. The God I believe in showed us how to love radically. I fail at this on a regular basis and yet I find that I can offer moments of radical love in my life. There are perfect moments for each of us out there when we can offer radical love. Even during a heartbreaking weekend, we caught glimpses of what radical love looks like: police officers running towards the gunfire, first responders from neighboring suburbs stepping in to assist exhausted first responders in the Squirrel Hill neighborhood of Pittsburgh, strangers comforting strangers. I for one need to become more radical – in terms of how I express my faith out in the world. Anybody up for trying out radical love? Image source here. 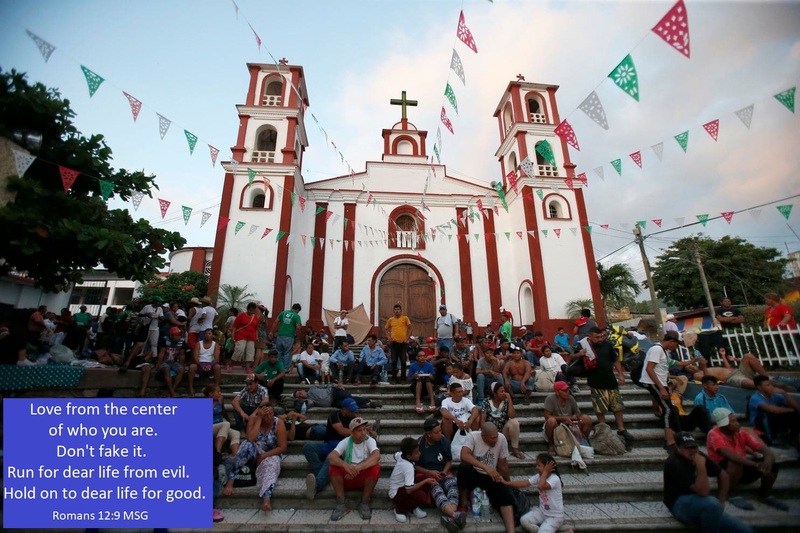 Mexican citizens in Pijijiapan outside a Catholic church building offering aid to migrants traveling from Honduras in “the caravan.” The quote is Romans 12:9 from Eugene Peterson‘s The Message. Thank you for your gift of hope and challenge this stressful Tuesday morning.